no way to determine how many members of the sequence will be actually needed. Scala offers an better solution for the same – the ability to define infinite sized data structures whose elements are computed on demand.These data structures are called streams. 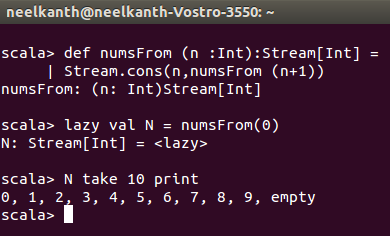 A stream is a list whose elements are not computed eagerly, but rather lazily. Eager evaluation means that a function first evaluates its arguments and then it uses them, while lazy evaluation means that an argument is evaluated only when it is needed.